Today I’m going to tell you about a unit I worked on with 4th Graders that was designed to address the societies of Native American tribes and their influences on American culture and history. I am not going to focus on the steps we went through in the Guided Inquiry process as much as I am going to explain what worked and what didn’t work. As a reference point this unit was designed during a three day Guided Inquiry Design Institute by Kennedy’s Gifted and Talented Teacher and myself. Classroom teachers were not able to attend the institute due to scheduling constraints. Obviously, the main obstacle for this unit was not having a teacher on the design team. Classroom teachers did provide a standard to work with and we knew they would willingly run with us as we dived into the process. As soon as we began planning the unit we realized how crucial at least one classroom teacher was to the development of this process. One, for their content knowledge. Two, for their understanding of where it would fall in the curriculum. Three, for the buy in they would be able to get from the other teachers on their team. The inability to have a teacher as part of the design process was a stumbling block throughout the unit, because we were never able to fully articulate the process well. I would say the second obstacle to this unit was in large part me. You see, I tend to want to go all out with something and try everything to make the process smoother. For this unit that meant providing composition notebooks as a tool for student to keep their inquiry log/journal in and later rolling out a similar format via Google Docs while using Google Classroom. Students never really latched onto the electronic log/journal, so it wasn’t too big of a hindrance. However, in hindsight I see that it was something that was not needed. I also admit to not utilizing the journal effectively. Partnership with the Gifted and Talented Teacher. My colleague and I did a lot of team teaching on this project, tag-team style. She was able to push into classes and teach how and what’s of the create stage. In addition, we teamed with teachers during the gather stage to help guide students along the way. She was a phenomenal asset and it was great for both of us to see how we could work together in the future. Willing classroom teachers. Even though the classroom teachers were not able to attend the training or help plan the unit they were always willing to do what we asked. The teachers also provided ample opportunities for students to research and work on their products during the create stage. We could not have done this unit without their support. Information Literacy Skills. Students were able to learn the proper way to cite sources during this project. They were able to learn how to “search smarter, not harder” using boolean operators. They were able to navigate EBSCO using the Explora database and found article were helpful for their research questions. Let’s be honest here folks, that is a difficult task for most of us and 4th graders were able to do that successfully multiple times. I often overlook how integrated information literacy skills were in this unit, but reflecting on all that students were able to do with them is one of the best things I am taking away from this unit. Immerse. The immerse phase was my favorite part of this unit. As part of immerse we were able to visit the Sam Noble Museum of Natural History on the nearby University of Oklahoma campus. The GT teacher was able to acquire a grant to the museum so that we did not have to pay admission for any of our students or chaperones. This museum has an exhibit called the Hall of the People of Oklahoma that the sole focus of dovetailed superbly with our content standard. 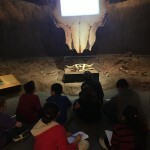 We were able to download resources from the museum and have students paste them into their journals that they were able to keep notes on as they were guided through the exhibit. Students were also given journal prompts in the exhibit and given the chance to reflect as they explored the exhibit. 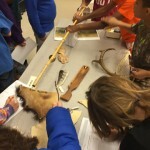 In addition to an exhibit students were led through a fifty minute class called, “The Bison Hunters: Native Americans of the Plains.” We had never been through a program at the museum and were skeptical of how this would go. We had nothing to be afraid of. 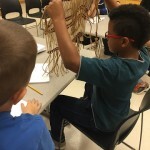 During this program students were able to explore specific items in a group and tasked with identifying what they were made out of and what their possible uses were. Every student was engaged in this activity and they were all excited to see what their items were. Following the exploration time and comparing to identified materials the museum educator led the classes through what each item was and what it was used for. Students were able to create lists in their journals that they referenced during the rest of the process. Items identified by museum staff that students used to compare to their artifacts. Google Classroom. Google Classroom was used to push artifacts and links to students during this unit. This was an effective way to get feedback from students as well. I used Google Classroom to provide templates, links and survey questions. Students completed surveys as an evaluative tool for their projects as well. The extended learning team. The staff at the Sam Noble Museum knocked it out of the park in the classes that they taught. The exhibit was exactly what we needed to provide greater background knowledge for many of our students. Our district technology integration specialist, Dr. Lee Nelson also provided templates for students to use in the create phase. This help let the teaching team focus on helping students create from the template and not to worry about how to create the template. This post has been difficult for me to write because there are things that went exceptionally well with this unit, but there are many things that the team will improve upon when we implement this unit again in the future. At this time two teachers from the grade level have since been to a Guided Inquiry Design Institute so that will be extremely beneficial as we go back and identify what we need to change in this unit. I am glad that the students and teaching team were able to go through this process. I’m glad that students were really forced to think and struggle with content in a new way and as a result create new knowledge from that struggle. I’m glad that I struggled with this process because it makes me look forward with instructional tools that I can use to make future units better. I’m glad that my GT teacher was able to such an integral role in the design and implementation of this unit because now she is my Guided Inquiry Design BFF. I’m glad that the classroom teachers from this team were able to see the process before they attended a GID Institute because they were able to make connections to what we did as they learned about the the process. Wait a second, who is the teacher and who is the student? The things I’ve learned this year with GID are endless. The students have taught me so much. As adults who are helping students become lifelong learners, it is important to remember that we are also lifelong learners. When students are allowed and encouraged to ask their own questions, authentic learning happens. I knew this, but seeing it firsthand was beyond what I imagined and understood. The students were enraged at some of the events that happened during the civil rights movement. They went beyond the who, what, and where questions, and focused on the why. This is at the heart of lifelong learning. The students didn’t spit out facts to pacify teachers for grades; they asked the socially conscious questions that could potentially help form who they become as people. If as educators we can design and implement lessons that end in students questioning such concepts of racism and discrimination, won’t we all be better in the long run? That’s the goal for me. When working with students, we are always looking for ways to improve and do it better next time. This is true for the civil rights movement unit that we did with 7th graders. While I couldn’t be more pleased with the depth of the questions the students asked, we need to make a few adjustments. These were mistakes that WE made, not a problem with GID or the students. As a team, we discussed that the novelty of working with all three classes together was a bit of a distraction for students at first. One possible solution would be for the students to have more opportunities to work in different groups throughout the year. Another mistake that we made was not having a note catcher for the students to work on while they were reading and discussing the articles at the stations. This would help to focus some of those little ones that aren’t necessarily interested in doing what they are supposed to do and provide a bit of comfort for the over-achievers that want to be doing everything right. One of the struggles that I need to personally work on is time. To do it properly, GID takes some time. It takes time to plan and collaborate, and time for implementation. I think this might be more of a challenge for middle and high school teams than elementary teams. At the secondary level in our district, students are only in class with a particular teacher for 50 minutes each day. In order to do a full unit, you need several weeks. Here is the deal, though. It takes several weeks IF you only implement in one class. When working on a smaller unit that I planned with English teacher Paige Holden, we were able to piggyback off of a lesson done in social studies class to drastically cut down on the time needed in English class. We didn’t have much time in the spring semester with the crazy standardized testing schedule that our students have, but by having social studies teachers do the first two phases of GID, we were able to squeeze in one more unit! We have 4 days of school left, and we can’t wait to see their final products. There seems to always be a solution to struggles through creativity and collaboration with colleagues.